The BCW Deluxe Acrylic Single Shoe Display Case features a black base with gold risers, clear cover, and a mirrored back. 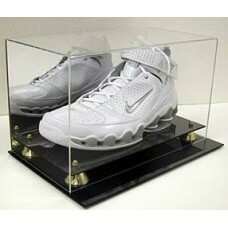 Use this sports memorabilia holder to protect, store and display your collectible shoes, sneaker, or cleats. Do you have any questions about BCW Deluxe Acrylic Sneaker / Shoe / Cleat Mirror Back Display?